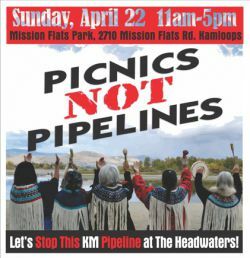 KAMLOOPS (SECWEPEMC TERRITORY) – Indigenous peoples living upstream from Kinder Morgan’s Burnaby pipeline terminal say their very existence is already under threat from the massive expansion project. Working Group on Indigenous Food Sovereignty spokeswoman Dawn Morrison says proceeding without prior and informed consent is illegal and has increased the risk and uncertainty the bitumen pipeline poses. 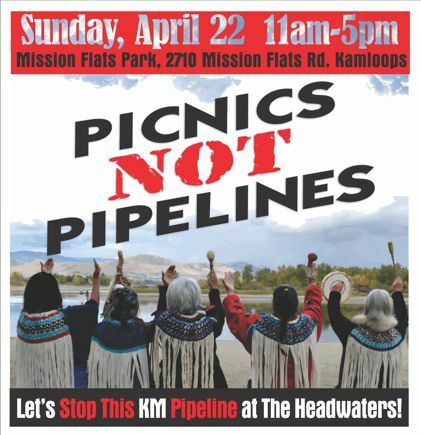 She says opposition to the pipeline upstream is growing and the Working Group is hosting a family-friendly Picnics Not Pipelines educational event in Kamloops on Sunday, April 22. The Working Group says that while much of the focus has been on the very real risks to the Salish Sea, Kinder Morgan’s pipeline project has already negatively impacted rivers and salmon habitat upstream, as well as the social and economic well being of Indigenous food economies. Anti-spawning mats placed in streams by Kinder Morgan have been removed by activists concerned about the threat to wild salmon - a cultural and ecological keystone species already seriously endangered. The food sovereignty advocacy group calls the failure to include Indigenous representatives at last Sunday’s meeting between Prime Minister Trudeau and the premiers of Alberta and BC “a continuation of the historical injustice of blocking Indigenous peoples from the very decisions that impact them.” It adds that threats of military or economic oppression of Indigenous peoples will only further inflame racist tension and ignorance.